Tumors of the skull base were at one time linked to a poor prognosis. 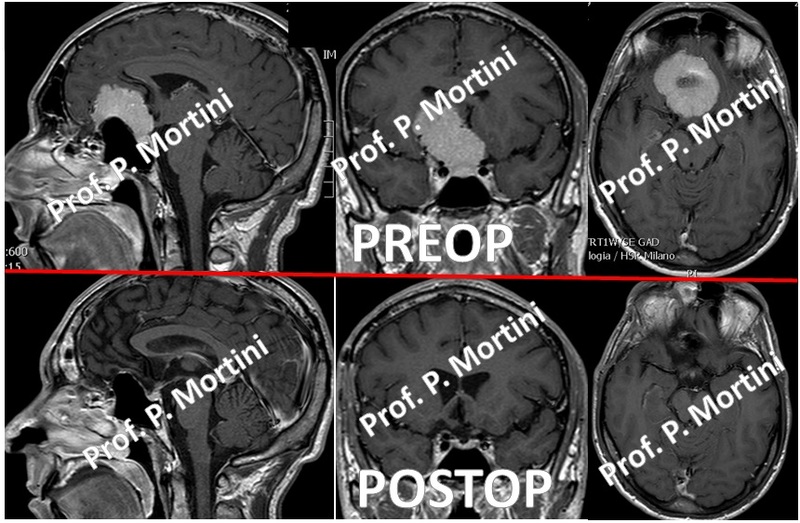 Advances in microsurgical techniques, an increased understanding of both the skull base anatomy and behavior of these disease processes, and improvements in neuroimaging have allowed such lesions to be successfully treated. The skull base is a complex irregular bone surface on which the brain rests. Contained within this region are major blood vessels that supply the brain with essential nutrients and important nerves with their exiting pathways. The floor of the skull is divided into three regions from front to back: the anterior, the middle, and the posterior compartments. The anterior compartment is the region above a person’s eyes, the middle compartment is the region behind the eyes and centered around the pituitary gland, an organ required for proper hormonal function. The posterior compartment contains the brainstem and the cerebellum. The brainstem is the connection between the brain and spinal cord, containing the origin of nerves involved in the control of breathing, blood pressure, eye movements, swallowing, etc. This connection occurs through the large hole, known as the foramen magnum, within the center of the posterior compartment. The cerebellum, lying behind the foramen magnum, is involved with coordination and balance. The roof of the skull base is composed of the brain itself and a thick sheet of tissue on which the brain rests, called the tentorium. Adding to the complexity of this region is the fact that each compartment of the skull base is at a different level. The anterior compartment is highest and the posterior compartment lowest, when a person is standing and looking forward. The presentation of patients with diseases of the skull base is highly variable because of the many important structures contained in this area. These symptoms occur due to compression on important nerves or by blocking the normal flow of fluid around the brain. Various symptoms are specified to the compartment involved. • Tumors of the anterior compartment may produce headache, sinus congestion, or vision changes. • Those of the posterior compartment produce neck pain, dizziness, tinnitus, hearing loss, and difficulties with swallowing and talking. The occurrence of these tumors varies with the age of the patient, his or her medical history, and family history. Due to the complexity of skull base surgery, these procedures are best performed at a tertiary care facility where there is adequate ancillary services available to the neurosurgeon in the management of these patients. Both operative and post-operative care requires expertise not only in the area of neurosurgery but also in the areas of neurophysiology, neurology, neurological oncology, radiation oncology, and intensive care nursing. Phrases used to describe skull base surgery designate the approach the neurosurgeon uses and include midline, paramedian, and extreme far lateral suboccipital, presigmoid, subfrontal, and Dolenc.